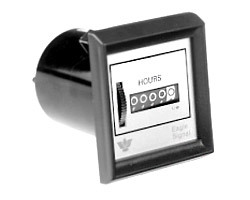 The Eagle Signal brand HK series time totalizer has a synchronous motor which drives a set of digit readout wheels to indicate the total time the unit is energized. Six digit-wheels, including a 1/10 digit on hours and minutes, provide a fine, wide range of time measurement. The HK features a front mounted reset wheel. It can be reset to zero at any time during its operation.